Dieng Volcanic Complex (Indonesia). On 26 September Dieng produced a ‘thunderous’ noise heard 2 km away, and on 27 December a phreatic eruption from one of the craters ejected mud up to 140 m to the S, leaving deposits 10 cm thick near the vent and 1 cm thick at the furthest point. Karymsky (Russia). A weak thermal anomaly was detected on 17 and 22 September. Seismic activity was at background levels 19-23 September, and seismic data indicated that ash plumes may have risen to 2 km a.s.l. during 21-22 September and 4.5 km a.s.l. on 23 September. Scientists passing in a helicopter on 22 September observed ash plumes rising to 1.7 km a.s.l. and drifting E.
Shiveluch (Russia). During 18-25 September seismic activity was above background levels. A large thermal anomaly was detected daily over the lava dome. Seismic data indicated that ash plumes may have risen to 5.5 km on 18, 19 and 22 September, and hot avalanches from the lava dome were observed on 18 and 22-23 September. Ash plumes were occasionally seen drifting 15-70 km N, NW and SE. Batu Tara (Indonesia). During 22-29 September ash plumes rose to 1.5-2.4 km a.s.l. and drifted 15-75 km W and NW. Chaitén (Chile). On 28 September a diffuse plume of ash possibly mixed with steam and gas rose from the lava dome complex to 2.4 km a.s.l. and drifted less than 40 km W and SW.
Dukono (Indonesia). On 24 September an ash plume rose to 2.4 km a.s.l. and drifted 65 km NW. Kilauea (Hawaii, USA). Lava continued to flow SE through the lava tube system during 23-27 September to the Waikupanaha ocean entry. 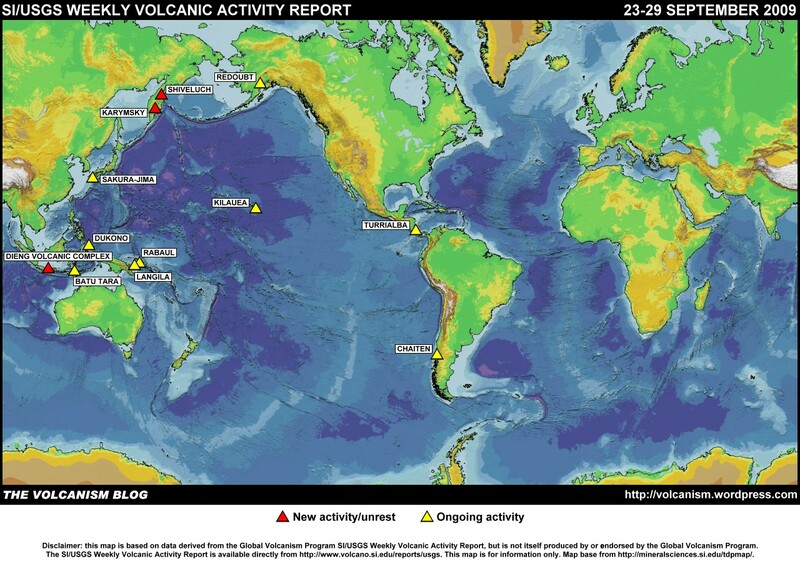 Lava was not observed entering the ocean on 28 and 29 September. Explosive activity at the ocean entry on 26 September was probably caused by a small bench collapse. Weak incandescence was detected from inside Pu’u ‘O’o crater, and from a gas vent on the E crater wall, on 23 September. Thermal anomalies and visual observations revealed active surface flows on most days. The Halema’uma’u vent continued to produce a diffuse white plume that drifted SW and W. Weak incandescence from the vent was visible at night. A series of rockfalls accompanied an apparent collapse of the vent floor on 26 September, causing the lava level to drop and the plume to turn ‘dusty brown’ for several minutes. On 28 September, a spattering lava pond was seen inside the vent.The sulfur dioxide emission rate at the summit remained elevated: 400 tonnes/day was measured on 23 September, 700 tonnes/day on 24 September, and 665 tonnes/day on 28 September (2003-2007 average rate = 140 tonnes/day). Langila (Papua New Guinea). An ash plume rose to 2.4-4.3 km a.s.l. and drifted 75-220 km NW on 29 September. Rabaul (Papua New Guinea). Grey ash plumes from Tavurvur cone rose1.5 km above the crater during 18-24 September, and ashfall was reported in Rabaul town and surrounding areas. Summit incandescence was occasionally visible at night, incandescent fragments were ejected from the crater and rumbling/roaring noises were heard, although to a lesser degree than 11-17 September. On 29 September an ash plume rose to 2.4 km a.s.l. and drifted 75 km NW. Redoubt (Alaska, USA). On 29 September Alaska Volcano Observatory lowered the alert level for Redoubt to Normal and the Aviation Colour Code to Green. Low seismic activity, volcanic gas output, ground deformation, lava dome temperatures, and outward signs of lava dome instability, have been declining during the previous several months. Sakura-jima (Japan). Explosions during 23, 25, and 27-29 September produced plumes that rose to 1.8-2.7 km a.s.l. and drifted SW, W, and NW. Turrialba (Costa Rica). Scientists from OVSICORI reported on 25 September that winds carrying toxic gases 10 km SW were causing trees to exhibit mild burns to a greater degree than effects from the previous year, and Vegetation within a 4-km-radius on the W, NW, and E flanks was burned more severely that previously noted. Several elongated fissures in the rim S of the W crater were documented, as well as 1 km down slope NW of the crater. One E-W-trending crack that was first seen several months before had opened up as much as 12 cm, and emitted gas and vapor at 90 degrees Celsius. On the NW lower flanks, at least three radial fissures emitted high gas-and-vapour plumes. Some fissures near the summit were 5-10 cm wide. 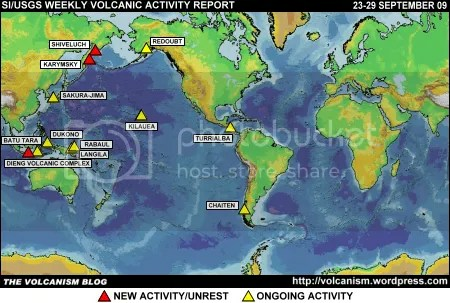 The foregoing is a summary of the Smithsonian Institution/United States Geological Survey Weekly Volcanic Activity Report covering 23-29 September 2009. It is provided for information only, and is based on but not a substitute for the full report, which comes with its own criteria and disclaimers. The map base is derived from the Smithsonian Institution/USGS/US Naval Research Laboratory This Dynamic Planet website.